The capabilities of 5G NR wireless access must extend far beyond previous generations of mobile communication. 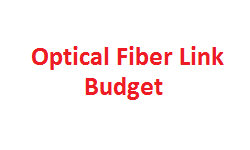 Examples of these capabilities include very high data rates, very low latency, ultra-high reliability, energy efficiency and extreme device densities, and will be realized by the development of LTE in combination with new radio-access technologies. Key technology components include the types of BS (Base-stations) in 5G, like MSR (Multi-Standard Radio) BS, AAS (Active Antenna System) BS. Massive MIMO is the back-bone for 5G network where 100 or more antenna elements are to be used for various benefits. But it is difficult to introduce massive-elements antennas (100 or more elements) that are required for massive MIMO into traditional base stations, attaching over 100 RF cables between each antenna element and RF TRX unit seems unrealistic and adding more RF losses. Using an AAS that combines the antennas, and RF TRX unit (transmitter and receiver chains), into one unit would be an effective way to resolve these issues. 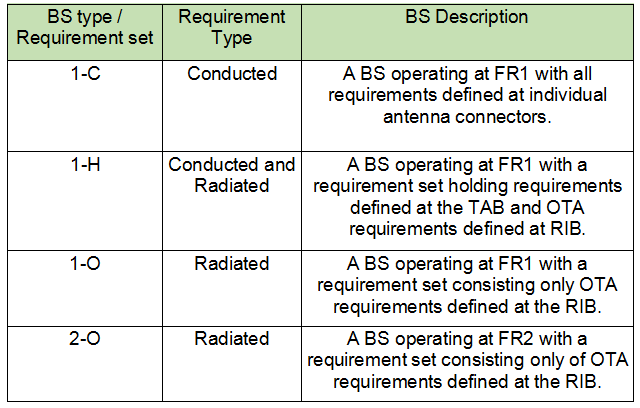 MSR BS specification is considered as non-AAS specification, defining conducted requirements because antenna entity is not a part of MSR BS, just like LTE eNodeB, where antenna is external entity. Due to evolution of the AAS, which has antenna integrated, initially led to the AAS specification which had both a conducted interface and an OTA (over the air) interface, this was then enhanced to provide an OTA only set of requirements, this has led to 2 types of AAS and corresponding requirement sets. OTA AAS BS which has only a radiated interface. This led to conducted as well as radiated conformance testing required for 5G BS and that also depends upon the frequency range the BS fall into. 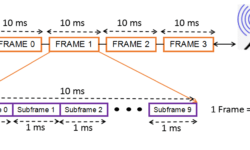 In 5G NR, there are roughly two large frequency range specified in 3GPP. One is what we usually call (sub 6 GHz) and the other is what we usually call millimeter wave. BS type 1-C (Conducted) requirements are applied at the BS antenna connector (port A) for a single transmitter or receiver with a full complement of transceivers for the configuration in normal operating conditions. If any external apparatus such as an amplifier, a filter or the combination of such devices is used, requirements apply at the far end antenna connector (port B). The BS type 1-H (Hybrid) the radio architecture is represented by three main functional blocks, the transceiver unit array (TRXUA), the radio distribution network (RDN), and the antenna array (AA). The point where a TXU or RXU connects with the RDN is called “Transceiver Array Boundary connector” (TAB connector). The TAB connector is defined as conducted requirement reference point. The RDN performs the distribution of the TX outputs into the corresponding antenna paths and antenna elements, and a distribution of RX inputs from antenna paths in the reverse direction. The RDN may consists of passive power splitter and combiners. OTA requirements are applied in the far field at the radiated interface boundary. 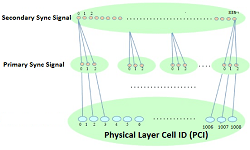 BS type 1-O and 2-O BS requirement are applied in the far field at the radiated interface boundary. 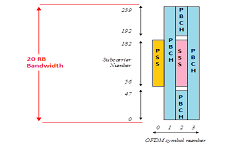 The OTA BS types have no transceiver array boundary or TAB connectors defined as they have no conducted requirements. 1-O requirement applies to BS operating at FR1 and 2-O requirement applies to BS operating at FR2.